Starring: Kristen Connolly, Fran Kranz, Chris Hemsworth, Richard Jenkins, Bradley Whitford, Amy Acker, Anna Hutchinson, Jesse Williams, Brian White, Tom Lenk, Sigorney Weaver, Jodelle Ferland, and more. Memorable Quote: "Let's get this party started!" 1) Acting - Thumbs Up - A lot of actors whose work I enjoy graced this movie - Amy Acker and Fran Kranz, who've been part of other Joss Whedon productions; Sigorney Weaver from the Alien films and Avatar; and Jodelle Ferland, who is an expert at looking like a creepy little girl. Acting veterans Bradley Whitford and Richard Jenkins made a great team as the project leads. I must give Kristen Connolly kudos for the 'truth or dare' make out scene. I wanted to applaud as heartily as her mates did. Tim De Zarn was creepy as could be and hilarious during the phone conversation scene. 2) Special Effects - Total Thumbs Up - Someone had a lot of fun making lots and lots of blood and then coming up with interesting ways to splash it around. Towards the end, the blood made wonderful statements without the need for words. Kudos for the beautiful eagle scene not far from the beginning of the film. The motorcycle jump was superb. Some of the entities seen later in the film were definitely fabulous. 3) Plot/Story - Total Thumbs Up - The beauty of this film was the story. A slowly unfolding set of events with hints given throughout as to what was being done and why. Many tongue-in-cheek moments as Mutant Enemy took this genre and others and played with the usual cliches and twisted them, made them into something new, or forced them to happen as those in the film were not falling for it. (I can't say too much. The film is better appreciated by knowing as little as possible before hand.) There are a ton of genre related in-jokes as well. 4) Locations/Cinematography - Total Thumbs Up - Some real and some CGI locations but all outstanding. 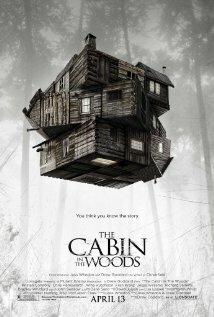 I loved the play with camera angles, especially on the final approach to the cabin. The scene with the eagle was beautiful and breathtaking. The panning back sequence from the elevator said all there needed to be said. They did a nice job with the cabin as well. Looked pretty much like a dump on the outside and surprisingly decent, and weird, in the inside. 5) Costuming/Makeup - Thumbs Up - The guys will very much enjoy the costuming for the two college coed leads. The makeup for the undead was well done. The makeup for Phantasm's cousin even more so. Conclusion: If you're a fan of Joss Whedon or a fan of horror movies, this is for you. Modern horror movie fans may find it a little tame, but the deviation from the norm will make it totally worth it.